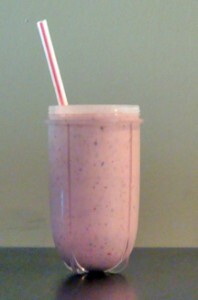 One day I just whipped up this strawberry banana smoothie and now I make them all the time for breakfast. It is healthy and fills me up for the morning. Too get some extra nutrients add flax seed to it. I never measure the ingredients. I just put my berries and banana in and fill the rest with yogurt and milk. If yours turns out too runny, use less milk next time. Every one’s tastes are different so make yours the consistency you like, I like mine pretty thick. Throw it all into a blender and blend until smooth. What’s your favorite smoothie recipe? I’d love to hear some other ones. Read the benefits of eating strawberries here.